We are a group of passionate signmakers and designers who have spent years perfecting our craft. Here's how we can help you. Perth Graphics Centre has spent the last 25 years creating signs and advertising solutions for Perth businesses. It is a long established fact that a customer needs to see a simple yet effective message. We can help design your signs. We don't just stick to the same old sign types. We come up with new and creative ways to get the message across. We pride ourselves on offering the best customer service in Perth. We're happy to chat on the phone, over email, or on-site. Signs aren't just read in one portion of the day. Our signs can work for you both day and night, with backlit and lightbox options. 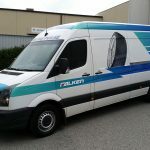 A vinyl wrap on a van is something that most sign shops can do, but here at Perth Graphics Centre we like to differentiate ourselves from the pack. 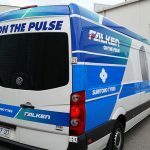 While most companies are using a cast vinyl with cast overlaminate, Perth Graphics Centre’s research of the latest vinyl wrapping methods has led to a new method of creating vehicle wraps. Thus, as you can see, the polyurethane laminate is a far better option and one that we have adopted across the board. With our new ink-set, you can be assured of better results from start to finish. 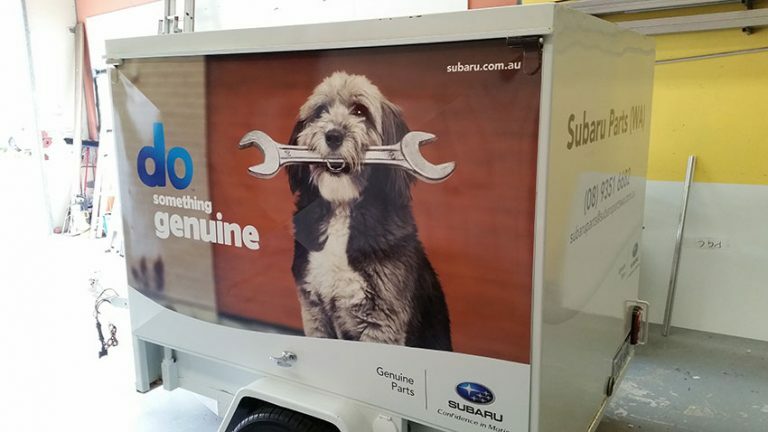 This is why worldwide brands come to Perth Graphics Centre. 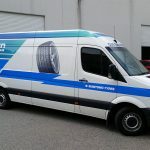 If you have a signage project, a fleet needing wrapping or just simple vehicle graphics, Perth Graphics Centre can do it all. 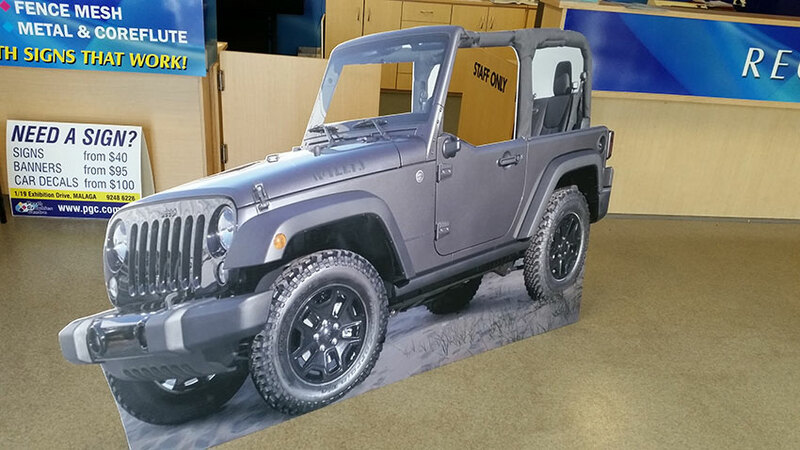 Custom cardboard cutouts are in high demand here at Perth Graphics Centre, which is why we’re equipped with the latest print machinery, ready to create whatever you can think of. 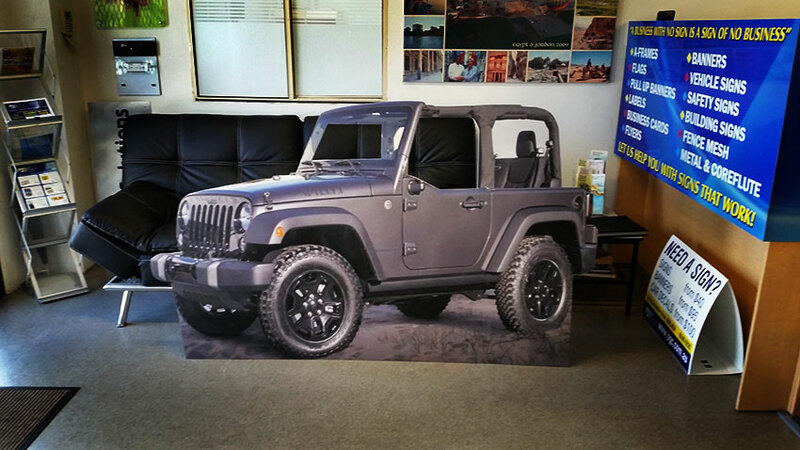 In this case, the customer wanted a cutout of a Jeep which they could use for photos. The window would serve as a frame for the person and they’d get an instant pic of them “driving” a Jeep. We made this particular cutout from a heavy duty plastic, so technically it’s not a cardboard cutout, but it’s a much more durable product. Can you imagine someone picking it up by its window frame? If it was a cardboard cutout, the frame would tear, and that’d be the end of the product. That’s why, with every job, we consult with the customer to see what the best application will be. In some cases, cardboard is perfect. In others, corflute is required. But for this job, a lightweight plastic was the best option. And if you’re wondering why the pic above looks strange, it’s a two-dimensional cutout being photographed in 3D. Don’t worry, the final result is perfect, and we have a very happy customer on our hands. If you have a cardboard cutout that you need, why not ask us for more information? We’re ready to help. 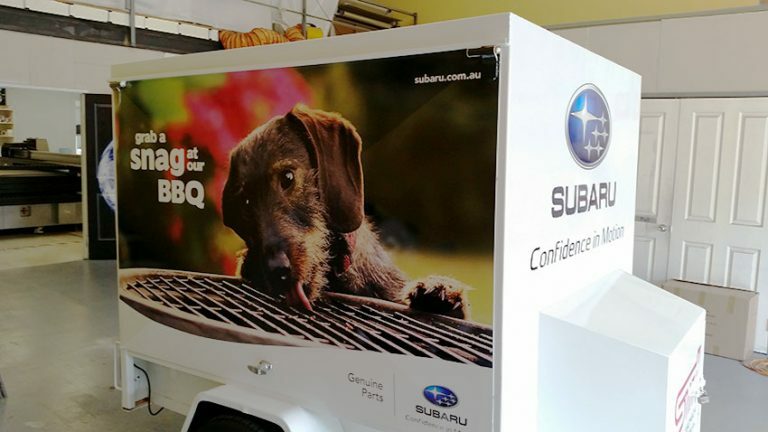 After a phone call from the eastern states, Perth Graphics Centre was contracted to print and install new graphics onto this barbeque trailer for Subaru WA. It was urgent because they wanted to use it for the upcoming Rally WA round. So, after obtaining the graphics, we went to work, making sure the colours were bright and the logos were crisp and sharp. 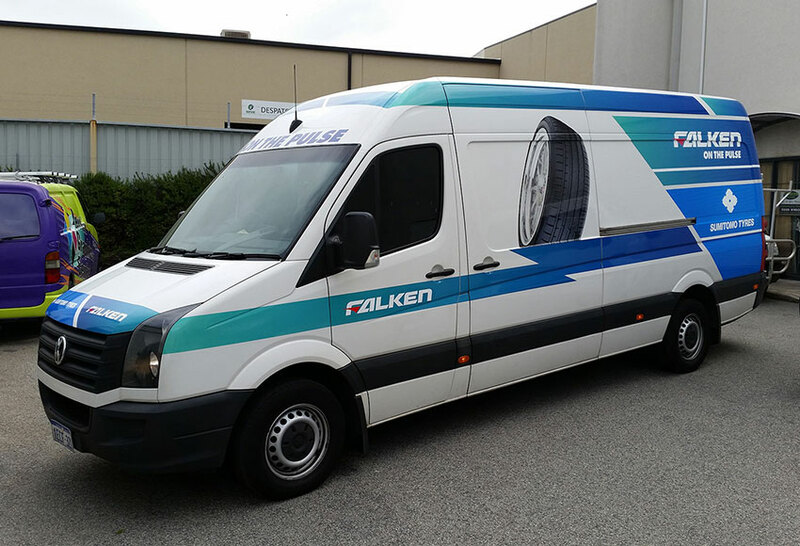 An extra challenge was wrapping the hinges in the graphics, but our expert team of installers did a brilliant job. Using high performance Avery films and solvent-based outdoor inks, the images are vibrant and won’t fade for years. 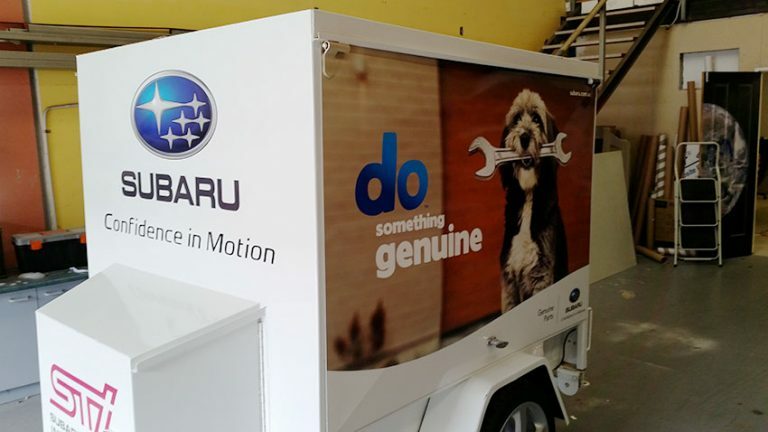 We’re confident that if you bring your trailer to us, you’ll be very impressed by the end result. Yes, if you have a trailer and you need signage, then give us a call by heading to our contact page. Do you have cardboard cutouts that you need? Perth Graphics Centre can help. 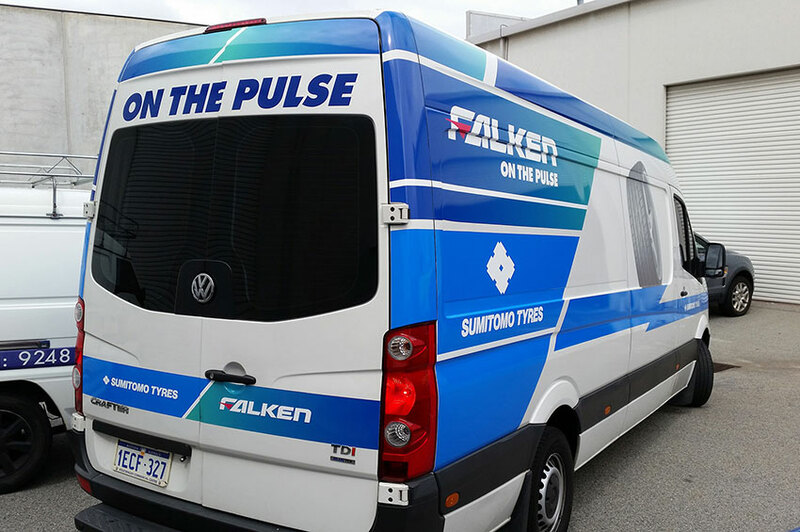 Whether it’s a one off or you need hundreds, Perth Graphics Centre can handle any order. 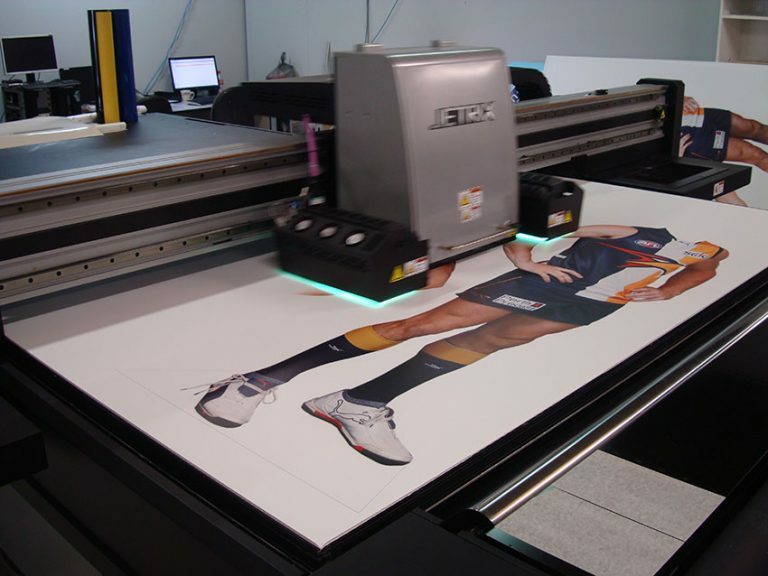 Seen here is a series of lifesize cutouts we made for the West Coast Eagles. We left the heads off so kids can get their photo taken as a West Coast Eagle. Our industrial printer (which you can see in this picture) prints directly onto the cardboard and it’s then profile cut. Our cardboard cutouts also include a stand so that they are freestanding. How long do cardboard cutouts take to make? Usually turnaround is a week, so make sure you plan ahead. We require high resolution artwork, which can be emailed to us or you can use Dropbox or WeTransfer. JPG, EPS or PDF is usually fine. And make sure you don’t infringe any copyright when you supply artwork. We’re sure that you’ll be pleased with the results from our cardboard cutouts. Perth Graphics Centre is here to help. We've had some work done by PGC in the past, small stickers and such but I got my work car stickered up by them today and all I can say is wow. I highly recommend them. Just thought I'd drop you a line to say thank you for your patience with me as we worked together to design the signage on my car - this has definitely been a head-turner, and I love the see-through film on the rear window.